The letter filled my heart and left me speechless. What it did really was to pull me into consciousness, as the beginning of it read, "Rachel finished her work on earth, and left the stage in a manner that leaves those of us left behind with a cry of agony in our hearts, as the fragile thread of our faith is dealt with so violently. Is anyone strong enough to stay conscious through such teaching as you are receiving?" Of course it is impossible to remain conscious and present to grief constantly, particularly for almost 24 years. But it's there. It's central to my life, to who I am, this loss that I experienced. Ram Dass says, "I can't assuage your pain with any words, nor should I. For your pain is Rachel's legacy to you. Not that she or I would inflict such pain by choice, but there it is. And it must burn its purifying way to completion. For something in you dies when you bear the unbearable, and it is only in that dark night of the soul that you are prepared to see as God sees, and to love as God loves." This evening on my way home I was listening to a really beautifully written book. The Dog Stars by Peter Heller is a post-apocalyptic novel, about a man who survives a flu that wipes out most of the world's population. He lives a mostly solitary existence, with one human companion, and with Jasper, his dog. Tonight on my way home, his dog died, and Heller's description of grief is one of the most moving I have ever read. I held out as long as I could, but I must confess I sobbed my way through much of the last leg of my drive. It's always so embarrassing when I do that! What must all those people in all those other cars think? Well, probably nothing, to be honest. Or perhaps they think it has something to do with the bumper sticker on my car. And of course, they are right, because once grief enters your heart, it is in your pores (as Heller says), and you cannot experience it again (even vicariously through a book or movie) apart from that which is a part of you. Heller said of his dog, "you are now the path on which I walk." (Perhaps not an exact quote, since this was an audiobook I was listening to.) Difficult phrase to grasp, and yet I grasp it. "You are the path on which I walk." I am sure there are those out there who will particularly not understand this kind of feeling about animals, and if you don't, that's fine, because the point is the experience of loss and grief, not the object of it. What you love deeply becomes a part of your path, even when it's gone. I can't figure out whether I am supremely optimistic or depressive. On the one hand, the knowledge of loss is my companion, but on the other hand, I am doggedly determined to make the experience of loss into something positive in life. Another little gem I came across today (on Facebook) was quote attributed to Viktor Frankl: "What is to give light must endure burning." All this pain, all this hurt, cannot be for nothing. My daughter's suffering cannot be for nothing. She was is such a brilliant light in this world. And yet sometimes, it is just an ache in the heart, a weight in the limbs. When I came home, I didn't know whether I should go out and walk it off, or curl up in a ball and go to sleep. So instead I sat down and wrote this, which is disjointed and circular I know. But it's just a piece of a story which has not yet been fully written. Well for being so disjointed it was incredibly deep. It made me think of my brother who I lost in 2005. He was develop mentally disabled and passed away suddenly from a blood clot in his lungs. When it happened he was living with me and was like one of my kids, even though he was 35. I lost complete blocks of time and seemed to just shut down. But eventually I picked myself up and carried his memory along with me. I think of him every day, sometimes it makes me sad but mostly it makes me laugh thinking about some of the things he used to do. Grief and depression are worse than taking a beating from Mike Tyson! Was Guy Rasmussen ever looked at as a suspect? He is from Lakewood, Washington and was arrested in the Cynthia Allinger case in 1996. It was featured on the Discovery ID channel's - Nightmare Next Door - series, and I instantly thought about Michaela. I do realize that Lakewood is a long way from Hayward, but this man was a "hippie" type that was known to frequent Rainbow (hemp) festivals for days at a time and was a heavy drug user. I wouldn't be surprised if he traveled at a whim out of state to go to a Bay area festival. 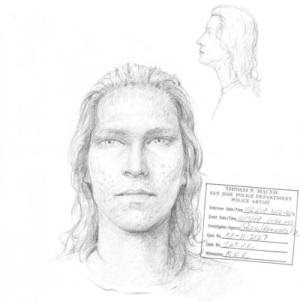 He would have been the right age in 1988 and he does resemble the suspect's sketch. He also has a history of offenses against young girls dating back to when he was just 16 years old, and the police suspect him in two other missing person cases but can't prove it yet. I'm not sure if there was a festival like that in the Bay area around that time, but it's possible. I was just curious to your thoughts on it. I looked it up. What happened to Cindy Allinger is terrible. I don't know whether Rasmussen has been considered in Michaela's case or not. The detective we have right now is the only one who has given me a lot of information, so I don't know everything that has been done over the years. Hello Sharon, I am a loyal reader to your blog and send you my prayers and blessings. I wish to know your opinion on Madeleine McCann. 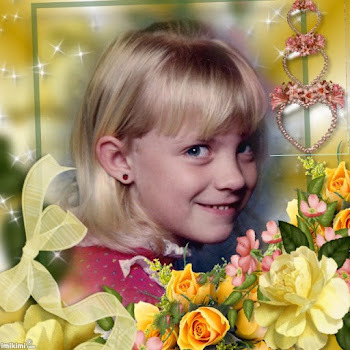 I am making a report on missing children and I want to include a few stories, honestly it´s hard to choose just a few from the many cases I have read. Every single one is different in story but with the same result, a very heart broken family. To the point I want to get is that (at least in my personal opinion) it angers me that the media only focuses on Madeleine McCann. Why is that? I read a story of a little 5 year old girl Jaquilla Scales who went missing in 2001 and her story was very brief in the media. To this day she has not been found and no one but her mother cares. Also another little boy from Spain went missing 2 months before Madeleine, but when Madeleine went missing everyone forgot about the little boy, except his mother who to this day keeps searching for him and trying her best to keep his boy´s face in the media. Why do you think that the media is so focused on the McCanns? Why isn´t that kind of coverage done to ALL the children who go missing. In every case I have read, it is the mother (like you) who are doing everything they can to keep their child´s image out. I am sorry to ask this since your post does not have to do with what I am commenting here. It is just that I am a bit upset at this. And Madeleine looked like a very sweet little girl, but what makes her more special?? I don't really know the answer to your question. I have often been asked about the amount of attention Michaela's case got compared to some others, and I think in Michaela's case it was because there was an eyewitness. People could see in their minds what happened to her. They could see how she had been tricked and could envision it happening to their children. It is not because I have aggressively promoted her story, because in fact the opposite is true. I am very happy in this day and age to sit in my home and pour out my words to the internet, but I have never been terribly comfortable with media appearances and I have never once personally issued any press releases or called the media. These days honestly I am a working mother with an extremely demanding job and it is very difficult to even find times and places to meet with the media on those occasions when they ask. The other answer I would give reflects some words I read recently in a Forensic Astrology blog about Michaela's case. They said that the reason it had never become a cold case is because the investigators had fallen in love with Michaela. This statement wasn't based on her appearance, but on something in the stars that I can't recall. But I think that this happens sometimes. And again, you may not like this answer, but I couldn't have got through the last 23 years without anchoring myself in some sort of belief in fate and spirituality. Sometimes I think that there are children who are here to, I don't know, teach the world something, change the world somehow, or even just a few individuals here and there, through what happened to them. There is a light that shines on them, or through them. I know all this may not make much sense, but it's the best I can do. And I thank you very much for your answer, and please do not think I am saying anything regarding Michaela´s case. I was just specificaly talking about Madeleines case. And wel I admire you and all those other mothers who are trying very hard to keep their child´s image out there, wether it is like you blogging and going frecuently to the police station, or other ways. And wether you like to believe it or not, you are all very strong women. And now that you mention it most of the interviews I have read on the other moms is that they too are extremely uncomfortable with the media, but they accept to be interviewed on behalf of their children. My hat is off to all of you, may God bless you all and give you the closure you all need. On the very first day, right after Michaela was kidnapped, a TV reporter came to my house and asked me to talk on camera. I told him no. He told me I should do it, said it would help my daughter. He was right, of course. It was the only way I had to "talk" to her, to the people who took her, to those who might know something. So I did. Tom DeVris, from channel 4 in San Francisco. He was a good guy. He covered Michaela's case for years. That is a very good question. There was an old song with the lyrics "tie a yellow ribbon around the old oak tree if you still want me," which I assume was about a returning soldier telling his sweetheart that he was going to cruise by on the bus and if he saw a yellow ribbon on the tree he would get off and if not he'd keep going. And of course the tree was covered with yellow ribbons. At Michaela's school there was a large tree (not sure if it was an oak) in the parking lot by where the kids got picked up. They called it "the waiting tree." One of the boys in Michaela's class came up with the idea of the kids tying yellow ribbons around the tree for Michaela. That's where the yellow ribbons started. Honestly, I believe this is the first time ribbons were ever used to symbolize the hope for a missing child, although it's become quite common now. Mrs Sharon, can you tell us more about that "Made up story" that recently a man claimed that he witnessed by Michaela's murder and burial by his father ? Can't say I know what you are referring to, Maria. Sorry, Maria, but the article the blog referred to is no longer available. But I am not going to print anything further under the tag of a "made up story." If the police decided to do a search, they must have had some reason. I lack the knowledge or psychic ability to pass judgment as you have done, having no personal experience of the situation. Sorry Sharon, I hope very very soon you get a resolution to your daughters case I just can't stop crying if that had happened to me, Someone taking me from my sweet loving mom and doing those horrors to me . :( I'm sorry if i offened you Sharon. please forgive me. Hi Sharon! What is your strongest lead that Michaela is still alive? The lead that she is in UAE. Also has there been any comments in your blog under anonymous that you felt with your heart that they could be Michaela's ? Just wondering. 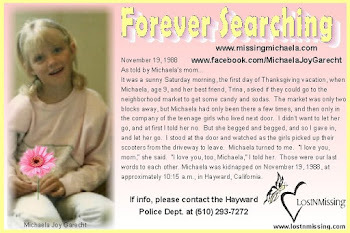 There is another lead from many years ago that is vewry compelling, which if true would indicate that Michaela was still alive quite some time after she was kidnapped, and that her kidnapping was for human trafficking type purposes. It is not something that I have been given permission to speak about publicly, however. Whenever a lead is released to the public it stand to muddy the waters, so I'm not going to do that. It could dovetail into the UAE lead though. There have been a couple of times I have thought perhaps someone on my blog might be Michaela. One was a pretty strong candidate, but turned out not to be her. when I was a teen my blue eyes changed to green and my hair changed to dark brown who knows? This is one of the reasons why I think it's pretty fruitless to try to use age progressions. I don't think we are going to find Michaela by posting a flyer of what she would look like now. I think it will have to come through an informer, or a happy turn of events as happened with Jaycee, or she will have to find herself. That's why I write a blog. Did that prison inmate who said he knew who murdered Michaela just to get back at his parole board ever get sentenced? Has there been any body accused of being Michaela? Louise, I have no idea what inmate are talking about. There have been a few prison inmates who claimed to have information about Michaela, but I am not aware of anybody who did it to get back at his parole board. There has only been one inmate sentenced for claiming to know how killed Michaela, and that was in 1992-1993. He received six years in federal prison for perjury before a Grand Jury, as he had been told he would before he testified before that Grand Jury. But even the judge at his sentencing noted that we could never understand his motivation for doing what he did, and carrying it so far even after so many warnings. People don't get sentenced for just giving incorrect information. They have to really work hard at that. And has there been anybody "accused" of being Michaela? Well, that is not a crime, you know. In 23 years there have been any number of people who thought they had seen or known Michaela, or who thought they themselves might be Michaela. I'm getting a feeling, Louise, that you are referring to something I'm not completely understanding? Oh my, I meant to say accused of impersonating Michaela I just forgot to add that to the question. Sorry :[ Ohh & yes that is the inmate I was talking about. Wow youre like a machine the second I add a comment same second you answer It, That's really Awsome! Well, I spend way too much time on the computer. And if I'm not on the computer, I have my iPhone. I get the messages in my email to approve before posting, so I always see them before they are put on the blog, and unless I am too busy I do try to answer them when I post them. But to answer your question, actually nobody has been accused of impersonating Michaela. There have been a couple of times people have called and/or left voicemails pretending to be Michaela. 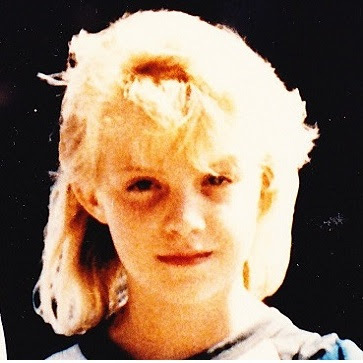 In the first case, right after Michaela's kidnapping, a child called several times, and while I was sure it wasn't Michaela, the call was traced, and the child responsible was found. The other time was a voicemail which we were not able to trace, but it really sounded phony, so I didn't lose sleep over it. Other than that, if anybody has impersonated Michaela they haven't let me know about it. There have been a huge number of people who have impersonated Michaela's family and friends, but that's another story, lol. has it ever occurred to you that michaela died on 9/11? That seems like probably the least likely scenario that anybody has ever mentioned. That's very strange - I have to say. I think a mother feels,knows her childs presence. Its hard to explain to anyone without children,or someone who is not a mother. Its more than just a hope,and in Sharons case, from what I have read of Sharons blog,the inner feeling that Michaela is out there somewhere is so vivid to her, that she is determined to never give up. 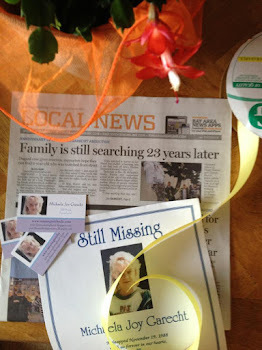 It would be ridiculous to ask or suggest to any mother to simply give up,fold on finding her missing child - especially one that she feels so deeply is still out there. Sharon is one of the strongest women I know and I applaud her unwaivering strength. I totally believe michaela is alive out there somewhere! Just had to say it. 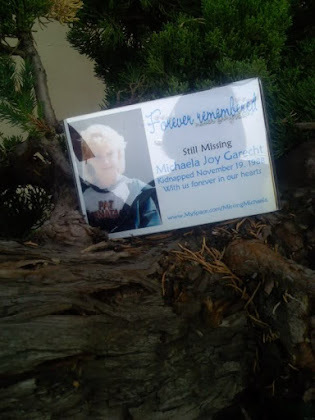 saw Michaela's picture in an article in the british press today... any word on whether the bodies recovered from the guy who previously mentioned her have any connection to Michaela? please let us know whenever you have information you can share. i am still praying for her safe return, but also that if she was harmed after her abduction that you finally get your answers. Michelle, the British press loves Michaela, something for which I am grateful for a number of reasons. But Shermantine has specifically said he doesn't "know anything about that Hayward girl," so I am not expecting her to be involved with these horrid people. Mrs Sharon I wish michaela would have gotten threw the other side of the car and or attacked the man or jumped out to freedom did an accomplice pin her down inside the car? We will never know the answers to those questions until Michaela is found, or her kidnapper confesses. What happened inside the car is unimaginable. Has It been ruled out that Amber Swartz killer was Michaela's too? The person who claimed to have killed Amber Swartz said he did not know anything about Amber. But I am not personally convinced he was telling the truth about Amber. I think it's possible he was just trying to cause problems because he was angry at Amber's mom. There is at least one lead that involves Michaela and Amber both, which seems like a pretty good lead. As far as I'm concerned, I wouldn't rule out the possibility of finding them both alive one day. I am sure she was a scared and shocked and even an adult would be paralyzed by fear. I read Ilene Mischelloff was alledgedly seen walking near an older model car. If true, I wonder if there is a connection. How are Michelle Michaud & James Daveggio suspects? They abducted women not little girls James does not look like the composite, and could michaela kidnapper be woman rather than male? 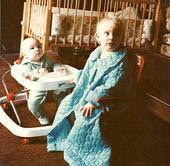 They were looked at in both Michaela's and Jaycee's cases many years ago. There have been other suspects in Michaela's case who were women. This there a composite of the car that Michaela was thrown in? I have always read Michaela's case,Ilene Misheloff,Amber Swartz,and Amanda "Nikki"Campbells cases as being linked - if you will. I guess because they were all taken from around the same area,within a period of about 2 to 3 years. Sharon never give up! 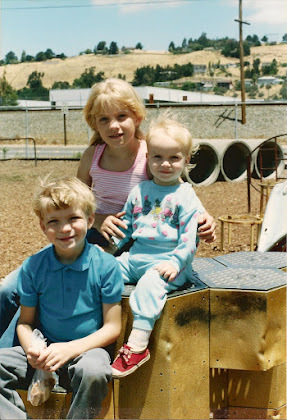 We finally got my sister back after 27 years. One important question got answered for us. We never thought we would fine Jo Ann. We received her not how we wish but now we can stop wondering. I wish you peace and know you'll get the answers you've been waiting for soon. Just know you are not alone we know the pain you have had to endure so stay strong. Thanks, Michelle. I have often wondered how it would be, to learn the worst. But not knowing is like holding your breath all the time. I'm sorry for your loss, and for your sister, but I'm glad you have found some peace. Michelle, if you get this message, could you e-mail me at sharon.murch@gmail.com. It took me a little while to get through all of the comments to post mine, and by the time I reached the bottom of the page I had nearly forgotten what I had wanted to say. But the tears are still wet on my face so my comments came back to me. while my grief in no way compares to yours, I completely agree that grief, once it touches us, is burned onto our souls. I find myself crying at completly odd things... Halmark commercials and Folgers commercials get me everytime... I find that I empathize with people whom I havenever met, I cry at movies where the stories are touching...evenmore than the normal person. I know it is due to the emotions surrounding the grief in my past. I just wanted to say thank you. Few people makke the connection, and many poke fun of those like me who are over sensative to the pain of others, even if it is just a movie/book/commercial. I checked out the book you reccomended. Quite an excelent read. I close in saying I am so sorry for your pain, and pray for resolution to all of this, for you, your family and your prescious daughter. Thank you, Beth. I think the only other choice is to harden your heart, live in denial. To remain open is the better choice, if harder. Yes, me too. I tried denial, distraction. I didn't even purposely try them ... just my self preservation instinct kicking in and trying to find something that worked. Now, honestly, I have so much empathy I have a hard time killing a bug. Well in fact, I don't. I catch them and take them outside.